Chic sunglasses complete and complement any outfit. Refine your look in an instant with a pair of shades, but be sure to choose the right sunglasses for your face. We all have a unique face shape and frames that suit us best. Here’s a complete guide to finding your best look! Oval faces are long in length, with a wider forehead and a face that narrows at the jaw. Your features are pretty balanced. Your forehead, cheekbones, and jawline are equivalent in length. You have a face shape that will allow you to wear any shape of sunglasses. Add sunglasses to your collection with whatever frames you fancy, you can pull of cat-eye, round, square, and more! Play around with different frames for different looks. Styles for you: You can try all of the trends for 2018! 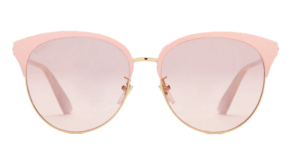 This season, try embellished cat-eye frames by Ferragamo, pink and gold framed Gucci sunglasses, or a square mirror-tinted pair by Chanel. Round-faced women have full cheeks, and a narrow forehead and chin. Look for shades that elongate and lengthen your face. Avoid round frames, which only make round faces look more circular. Wide shades and rectangular frames are best for you! 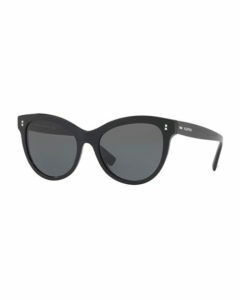 Use the sharper square and rectangle shaped sunglasses to counterbalance a round face. Styles for you: Try angular shapes like these big, bold square frames by Celine. Wide and square frames are in-trend right now. 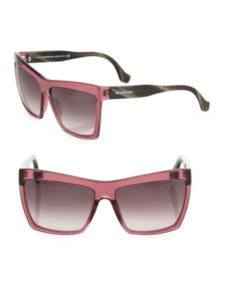 Ultra-sleek, rectangle Bordeaux Balenciaga frames would be a stylish option for you. 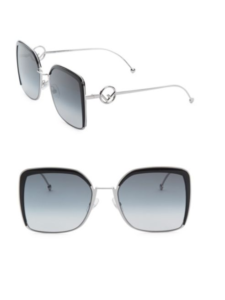 Or try dainty silver frames with ultra-wide lenses by Fendi. This season, there are so many options for round-shaped faces! Heart-shaped faces have wide foreheads and cheekbones, and a narrow chin. Opt for cat-eye and round frames; they look best on you! Styles for you: Round, retro sunglasses are big in 2018. The smaller, round styles of the 90’s are back this year. 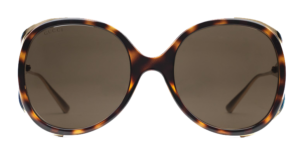 Round frames are sleek and timeless, and perfectly flattering for you. 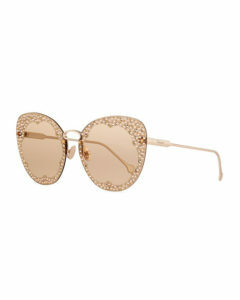 These round, pearl embellished pair by Chanel are perfect for the summer. Or a timeless pair by Dior. 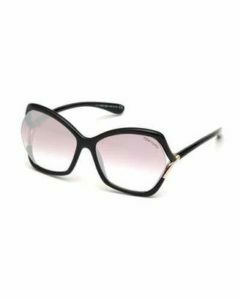 If you prefer the contemporary yet classic cat-eye sunglasses, a black-framed Valentino pair would be darling on a heart-shaped face. Not to be confused with oval faces, oblong-shaped faces are longer than and not as wide as oval faces. Oblong faces are long with a narrow chin and cheeks. Oversized glasses look great on you! They don’t flatter all face shapes, and sometimes overpower, but not on you! 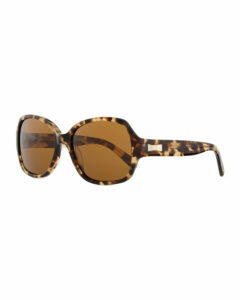 Styles for you: Try over-sized tortoise frames by Kate Spade this season, or Tom Ford’s over-sized butterfly frames. 2018 is the year of the statement sunglasses, which you can add to your collection because they will look absolutely charming on you! 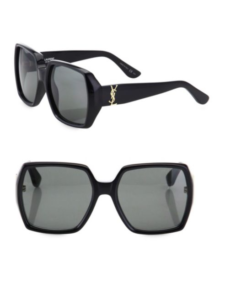 Over-sized frames of all kinds include geometric shapes, embellishments, or a pair of over-sized logo-mania sunglasses by Saint Laurent. Square faces have broad foreheads, squared jawlines, and strong chin. If this describes you, try aviators, round, or butterfly frames. These shapes will help round out a square face. 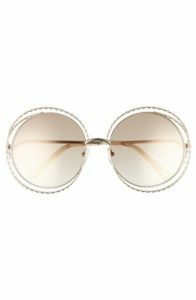 Styles for you: This delicate gold-framed, round pair by Celine would suit you. 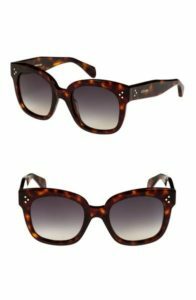 Lovely brown and gold butterfly frames by Chanel would look stunning on a square face shape. If you would prefer a larger style instead of the trending, tiny round frames, aviators complement you very well. 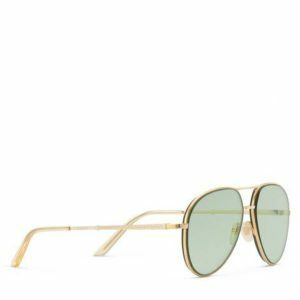 Always in vogue, Gucci aviators are a striking choice for your face shape. Complete your summer collection with a pair of sunglasses that flawlessly fit your face and accentuate your features! There are so many shapes and styles to choose from this year, making it easy to find the perfect additions to your sunglasses collection. Very useful article. Thanks for sharing it. And I only want to add, that when we choose sunglasses we should be aware of their protection level. The sunglasses are not only accessorize, but we wear them to protect our eyes from the ultraviolet rays. Thanks, Joanna! We agree completely and appreciate you saying so here.